Here's a wonderful and rather unusual piece of calculating history. This is a Wang Model 360SE Calculating System. 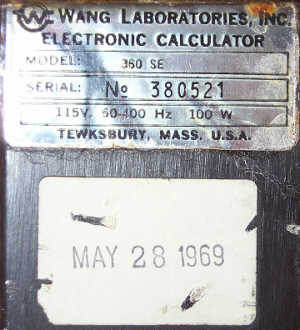 Wang Laboratories (Tewksbury, Massachusetts), founded in 1951 by Dr. An Wang as a one-man electronics company, became famous for revolutionizing electronic calculators by providing higher level math functions which previously were only available on very expensive computer systems. Dr. Wang invented a combination of digital electronic circuits (patented in 1968) that used a method called "factor combining" to generate the base e logarithm of any number. The properties of logarithms make it much easier to perform functions such as square root, raising numbers to powers, as well as dramatically simplifying multiplication and division via electronic circuits. Using any other method to perform such calculations would have taken far too many components, resulting in a larger and more expensive machine. The factor combining method of generating logarithms was particularly suited for implemention in electronic circuitry because the algorithm uses only a table of constants, addition, subtraction, and multiplication and division by 10 (which is easily accomplished by simple shifting). The 300-series of calculators were the second line of electronic calculators introduced by Wang. The first programmable electronic calculator marketed by Wang Laboratories was the LOCI-2, (LOCI, pronounced "Low-Sigh", is an acronym for LOgarithmic Computing Instrument) introduced in January of 1965. The LOCI-2 was rather large and clunky, and really not very intuitive in terms of its operation, making it more useful to scientists and mathematicians rather than business people. 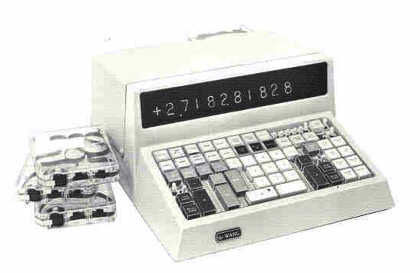 The LOCI-2's introductory price of $6500 was significantly higher than other calculators (electronic and electromechanical) of the time, but the machine could perform complex math operations with a few keystrokes, as well as offering optional programmability via punched cards, which gave it an advantage over other electronic calculators of the time. The LOCI-2 calculator used Dr. Wang's logarithmic calculation circuit, and proved to an eager marketplace that the electronic calculator had a place in engineering and scientific calculations. The LOCI-2's marketplace lifetime was short, though, due in part to its complex and non-intuitive operation, and also due to the introduction of the Wang 300-series calculators, which were easier to use, smaller, and less expensive. The 300-series machines were first publically shown in October of 1965, and received a great deal of interest from a market hungry for (comparatively) low-cost number crunching power. The response was tremendous, giving Wang the confidence to make the investment and begin mass production of the calculators. The first machines went into production in March of 1966. The initial introduction consisted of three models, the 300E, 310E, and 320E. The electronics package on all of these units was virtually identical electronically, with the 320E containing a full compliment of cards, the 310E missing one card, and the 300E missing two cards. Each model of electronics package had a corresponding keyboard unit that was plugged into it. 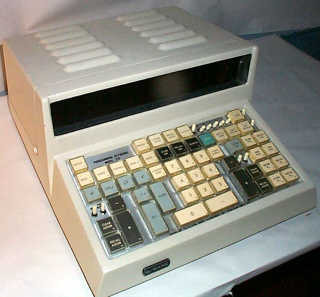 The Model 300E calculator used the 300K keyboard, which provided no access to the scientific functions. 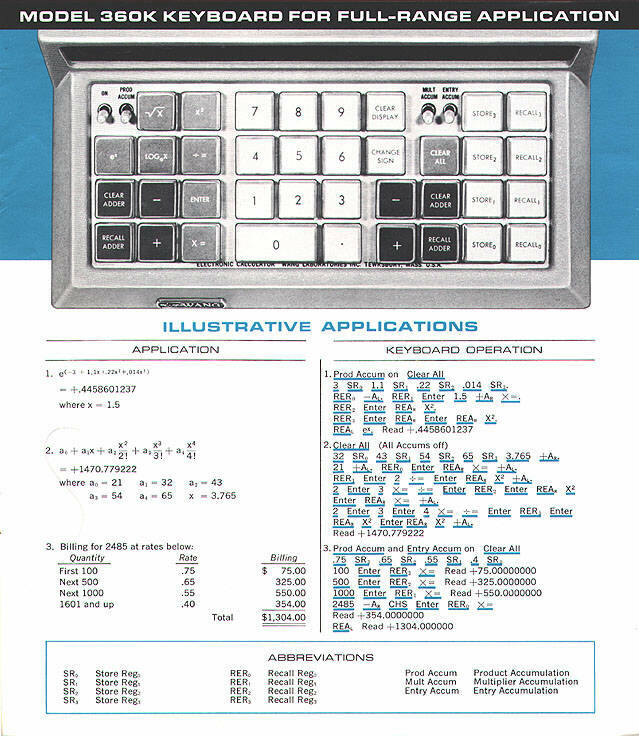 The Model 310E calculator came with the 310K keyboard, which added single-key squaring and square root functions, and the Model 320E calculator came with the 320K keyboard, which added natural logarithm and antilogarithm to the functions of the 310. 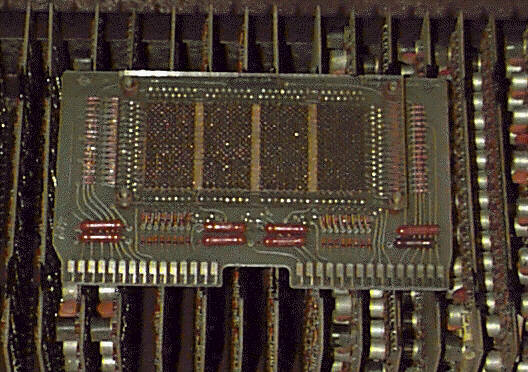 Note two missing boards with factory masking tape over the connectors. To some degree, the Model 300, 310 and 320 calculators were clever marketing ploy. The only real difference between a Model 300 system and a 320 (which cost over $400 more than the 300) was the addition of two simple circuit boards populated with diodes and resistors in the electronics package, and changes to the keyboard/display unit including the addition of four microswitches; four keycap assemblies; and a keyboard bezel punched with four additional holes for the scientific function keys. These changes certainly cost Wang Laboratories much less than the $400 difference. However, in terms of functionality, the functions provided on the Model 320 calculator were probably worth much more to scientists, mathematicians, and engineers who found the instant answers to more complex math operations a godsend. The same differences existed in the simultaneous calculators, (the 300SE, 310SE, and 320SE, as well as the 210SE and 250SE), with the only differences in the electronics packages being the removal of one or two diode logic boards. In March of 1967, Wang teased the marketplace with an announcement in Information Display magazine showing a photo of an electronics package with four 300-series keyboard/display units connected to it. The photo shows an electronics package that is quite different than what actually went into production. Wang Labs had a tendency to "preview" (to put it nicely) products months, and sometimes more than a year before they were actually available. This announcement article is a prime example of this tendency. By early 1968, the "SE" (Simultaneous) calculator electronics package designs were solidified, and some (still vaporous) announcement articles began to appear in the press. Actual production of the initial simultaneous models (300SE, 310SE, and 320SE) began in February of 1968, almost a year after the "tease" introduction. The top-of-the-line 360SE, as exhibited here, was introduced at the BEMA (Business Equipment Manufacturers Association) show in Chicago (International Amphitheatre), and the ISA Show (NY Coliseum) in New York on October 28, 1968. After the 300-series calculators were on the market for a while, it became apparent to Wang that the machines had a problem that made them unsuitable for a sizable chunk of market share. The machines, while truly stunning in their applicability for scientific and engineering functions, were a bit tedious to use in financial realms. Finance folks like to have answers presented in dollars and cents. The floating decimal system used by the 300-series calculators was perfect for scientific and engineering functions, as the decimal was always positioned correctly for maximum accuracy. In the case of financial calculations, only two digits behind the decimal point are really needed, with appropriate round-off occurring based on the third digit behind the decimal point. Re-engineering the 300-series architecture to switch to a fixed decimal point mode would have been expensive, requiring an almost new design. Rather than do this, addition of a rather simple logic board created a new series called the 200-series, that provided an automatic round-off at the third digit behind the decimal point. So, 2 ÷ 3 on a 300-series calculator would give 0.666666667, while on a 200-series machine, would provide 0.670000000. The decimal was still floating, but since there was never any result beyond the second digit behind the decimal point, the 200-series was perceived as more suitable for financial and business use. Two machines were introduced in the 200-series, sometime in late 1967. The 210SE, and the 250SE were produced specifically to meet the needs of business and financial users. The 210SE used a Model 320SE electronics package with the addition of the special "round-off" board. The 250SE used the 360SE electronics package with the round-off board, providing additional memory register capacity. The 360SE electronics package exhibited here was sold in May of 1969, based on the in-service date sticker. A Wang 300-series system consists of an electronics package (Wang's term), and keyboard/display unit(s) that plug into the electronics package. The electronics package contains all of the brains of the calculator system, and the keyboard/display units provide the operator interface to the calculator. The 360SE electronics package consists of 32 printed-circuit cards (Wang called the circuit cards "LogiBlocs") that plug into edge-card connectors. The backplane is hand-wired, using individual wires connected to square pin tails on the edge connector sockets using a unique clip system. Some of the later (early 1970's) 300-series non-simultaneous electronics packages that I have seen use a printed-circuit backplane. 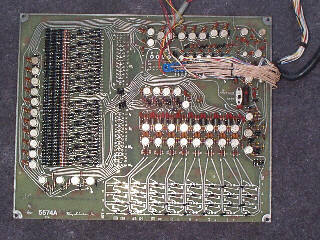 It may be that the simultaneous versions of the electronics package always used a hand-wired backplane (because their complexity may have precluded the use of a printed- circuit backplane), and the less-complex single-user electronics packages may have started out using a hand-wired backplane, later switching to the printed-circuit backplane once the printed circuit technology was perfected. I have not yet come across a simultaneous electronics package that did not have a wired backplane, while I have seen both wired and circuit board backplanes in non-simultaneous 300-series electronics packages. If you have a Wang 300-series electronics package, I would very much appreciate it if you could send me information on the model number, serial number, and the type of backplane that the electronics package has. 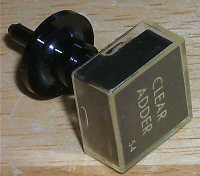 The LogiBlocs have components and traces on one side, and traces only on the back side, with jumper wires providing connections between sides of the board. In all of the general circuitry of the machine, standardized components are used. Most of the transistors are of the same type (made by RCA), with exceptions in areas such as the timing and control circuitry, core stack drivers and amplifiers, and display driving circuits. The logic appears to be fairly generic diode-resistor/transistor logic for gating functions, and basic types of flip-flop circuits for registers and counters. The three main registers of the calculator (two adder accumulators and the logarithm accumulator) are stored within the core memory subsystem. The core subsystem also contains the store/recall memory registers in models that offer this feature. In the 360SE, a single circuit card contains four core arrays and steering diodes. Another couple of boards have the timing/sequencing, driver, and sense amplifier circuitry to control the core array. There are two types of 300-series electronics packages; the E models (see the exhibit on the Wang 360E for an example), and the SE models. The E-version of the electronics packages provide one connector for plugging in a keyboard. Wang provided special connectors (see photo) to allow multiple keyboard/display units to be connected to an E-series electronics package, but only one keyboard/display unit could be used at a time. The SE (with the "S" standing for Simultaneous) electronics packages have four connectors for plugging in keyboard/display units. All four keyboard/display units operate at once as independent calculators, with the logic providing a round-robin timesharing of the computing electronics amongst the keyboard/display units. The base Wang-300-series system was the Model 300. This entry-level system came with the 300K keyboard/display unit, and provided access only to add, subtract, multiply, and divide functions. 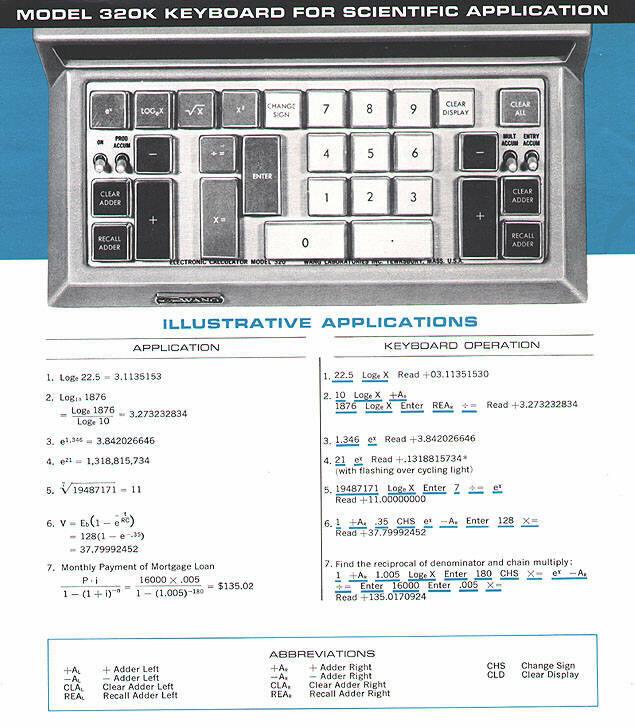 The Model 310 system provided the model 310K keyboard/display unit, which added access to one-key squaring and square root functions. The Model 320 system added to the 310's functions with addition of ex and Loge(x) functions to the 320K keyboard/display unit. 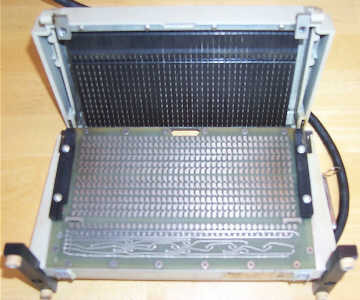 The Model 360 system came with the 360K keyboard/display unit, that added access to four store/recall memory registers in addition to the functions provided by the 320K keyboard/display unit. In March of 1969, an additional model was added to the 300-series, the Model 362E electronics package, wth the 362K keyboard/display unit. The 362E provided more memory, and a different scheme for addressing the memory storage registers, providing access to 12 'full' (14-digit w/sign & decimal location) memory registers, or 24 'half' (6-digit w/sign & decimal location) memory registers. Functions were provided to store or recall to a 'full' register, or to each 'half' of a specified register, along with the ability to add or subtract a value from a full memory register. 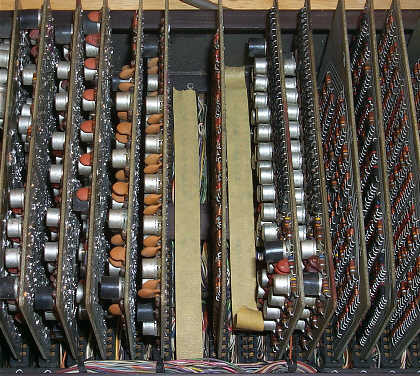 Memory registers in the 362 were addressed by pressing a digit from zero through nine (to address memory registers 0 through 9) after the memory command key, or "CLEAR DISPLAY" (for memory register 10), or "CHANGE SIGN" (for memory register 11). Optionally, there were versions of the 320K, 360K or 362K keyboard unit available that provided built-in programs for trigonometric functions. There were two different versions of the 320/360/362 trig keyboards, the KT and the KR. The KT model keyboards (320KT, 360KT and 362KT) use degrees for the trig functions, while the KR versions use radians. 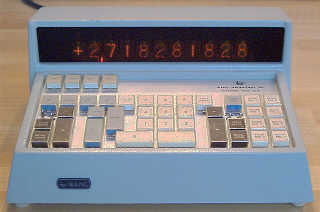 The KT and KR keyboard/display units are unique in that they include a transistorized sequencing unit built into the keyboard unit that provides ROM-based programs for calculating sin, cos, sin-1, and tan-1 functions. The keys for these functions are at the upper-left of the keyboard as pictured above. 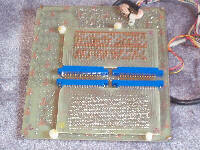 This photo shows the sequencing board inside a 360KT trig keyboard. This sequencer provides a series of virtual keypresses to the electronics package to perform the trigonometric functions. There's a small slide switch on the right center of the sequencer board that is marked "Cont/Step". Immediately to its right is a micro-switch that, when activated, will perform one program step of a trig operation when the slide switch is in the 'Step' position. Diode-ROM arrays on two plug-in cards are mounted on the back of the sequencer board which contain the keypress sequences for the trigonometric functions. The difference between the KT and KR trig keyboards is the plug-in ROM arrays which make up the programs for the trig functions. 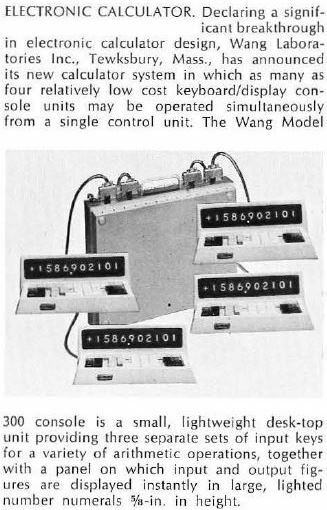 It appears that somewhere between the introduction of the Wang 300-series calculators in 1965, and sometime in late 1968 to early 1969, Wang changed the design of the 300-series keyboard/display units. The early keyboard/display units used a heavy metal casting for the cabinet of the keyboard/display unit. Later, the design was changed to use a cast high-density plastic cabinet. The 300K, 310K, and 320K keyboard/display units all share the same basic electronics, which consists of two circuit boards. One of the circuit boards is the keyboard assembly. The keyboard circuit board is identical between the 300, 310 and 320K keyboards, with the difference being only the keys installed. The keyboard circuit boards are populated with all of the necessary switches to provide the scientific functions, but there are no keys installed on the 300K keyboard, and only the square root and squaring function keys are installed on the 310K keyboard. The keyboards of the 300-series Wang calculators are a follow-on to the design of the Wang LOCI-2 keyboard. The keyboard circuit board contains a number of micro-switches, as many as there are keys on the keyboard. A special keystalk assembly causes the motion of the depression of a key to press the actuator on the micro-switch, closing the switch. The spring pressure of the micro-switch pushes the key back up when released. This makes for very little key travel, perhaps 1/4- inch at the most, but it is a very positive key actuation, with a nice 'click' when the key is activated. The keycap legend is simply a printed piece of card stock, that is retained under a clear plastic cover that snaps over the top of the key. The 300-series machines calculate to a full 14 digits of accuracy, but only display 10 digits. This makes the machine quite accurate. Since the Wang calculators used logarithms to perform multiplication and division, and even though Dr. Wang's log-generating circuit produced very accurate results, many logarithms are transcendental numbers which can never be represented with 100% accuracy no matter how many digits they are calculated out to. Because of the use of logarithms for multiplication and division operations, the previous-generation LOCI-2 could come up with results which would be slightly off. An example would be multiplying 6 by 8. The LOCI-2 would give an answer of 47.99999999. While 47.99999999 is technically useful as a reasonably accurate answer, such a result was generally considered incorrect by most calculator users. To make the 300-series more intuitive, these machines got the benefit of a special circuit that provided a round off function, which would cause such 6 x 8 to yield 48.0000000, which made the 300-series machine much more useful to non-technical (such as business and financial) users. This round-off function operated based on the non-displayed 11th digit (remember, the machines calculate to 14 digits of accuracy internally) of results. The display circuit board is the same between all of the 300, 310, 320, and 360/362 keyboard/display units. The display is multiplexed, with the decoding done on the circuit board by a series of diode/resistor gates with transistor drivers. The display uses individual Nixie (a name developed for the tubes by Burroughs, the company that invented the display technology) tubes. The tubes used in the Wang 300-series calculators were manufactured for Wang by National Electronics, which was headquartered in Geneva, IL. Nixie tubes display numbers by having ten different stacked electrodes which are formed into the shape of digits, all packed into a little glass envelope that looks like a small vacuum tube. The tube is filled with a mixture of gases, consisting mostly of neon. When a given electrode is energized with sufficient voltage (typically between 150 and 250 Volts DC), the gas around the electrode ionizes, forming a glowing orange digit. 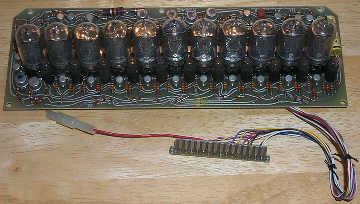 Nixie tubes were commonly used in electronic equipment requiring numeric output through the early '70's, when other less complex (and expensive) display technologies displaced them. All of the Nixie tubes in the Wang 300-series keyboard/display units have pins (like old vacuum tubes) that plug into sockets on the display driver circuit board. The digit display tubes have Wang part-number 340-0004, or National Electronics part-number NL-840. An special eleventh Nixie tube, situated to the far left of the display, containing only + and - (along with an 'upside down 8' that isn't used in the Wang application), is used to indicate the sign of the number in the display. This 'sign' tube has a Wang part number of 340-0005, or National Electronics part number NL-843. 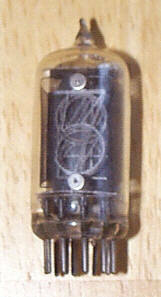 Decimal points are indicated by small discrete neon bulbs which are situated between the Nixie tubes. The machine performs fully automatic decimal point placement, which was a rare feature in early electronic calculators. Overflows result in the overflow digits being discarded, and an 'overflow' neon bulb at the far right end of the display that blinks when a detected overflow condition occurs. As mentioned above, there were two basic types of electronic packages available, the "E", and the "SE" versions. 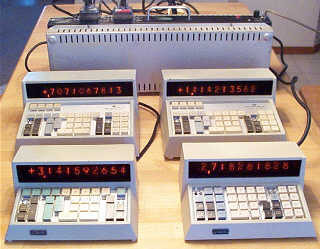 The "S" stood for simultaneous, meaning that up to four keyboard/display units could be connected to the electronics package, and operate simultaneously as independent calculators. The "SE" model machines add circuitry to the electronics package to allow it to timeshare between each of the four keyboard/display units. Timesharing between the keyboard/display units is done on a round-robin basis, with each 'slice' of time ending when an operation is completed, i.e., if one keyboard/display unit is performing a calculation, the others are locked out until that operation completes, then the other units are given their slice of time. Generally, this time-slicing is performed quickly enough that it appears to each user as if they have their own dedicated calculator. The 360SE electronics package provides two add/subtract accumulators (called the 'left' and 'right' accumulators, based on their keys location relative to the numeric keypad on the keyboard), 4 memory store/recall registers, multiply, divide, square root, x2, Loge(x), and ex functions for each keyboard/display unit. It's up to the keyboard/display unit to provide access to these functions. Multiplication and division are performed using addition/subtraction of logarithms. Entering a number, followed by the [ENTER] key causes the natural logarithm of that number to be calculated and placed in a hidden register (not a stack, as in RPN-style calculators with ENTER keys). Entering the next number, followed by either the [X] or [÷] key, causes the natural logarithm of the entered number to be calculated, then the result added (in the case of multiply) or subtracted (in the case of divide) to/from the hidden register, then the antilogarithm of the result calculated, and put into the display register. It sounds complicated, but it means that multiplication and division are, in reality, completed with simple addition and subtraction of logarithms. This method made the machine significantly less complicated than machines that used shifting and counting mechanisms to perform multiplication and division, and had the benefit of providing the logarithmic operations to the user, which, at the time, no other calculator could offer without complex programming that rendered answers much more slowly than the Wang calculators could. Wang offered a number of peripheral devices for the 300-series machines, including a punched card reader, Model CP-1, that used special Wang-provided (but manufactured by IBM for Wang) cards that have die-cut punch areas that can be manually punched out using a pencil point or other pointed object. These cards are similar to the (in)famous "hanging chad" punched cards used by Florida in the 2000 Presidential Election. Wang sold an accessory (made by IBM for Wang) called a "Port-O-Punch" that made punching cards easier, providing a fixture for the card to set it, with a clear overlay that made it more positive in terms of punching the card. The Port-O-Punch provided a special stylus that also helped make it easier to punch the cards accurately. Along with making the punching process easier, the Port-O-Punch collects the 'punches' (called "chad") for easy disposal. Each punched card card holds up to 80 steps. The card reader is connected in series (daisy-chain) with a keyboard/display unit. Program instructions consist of a 6-bit code that corresponds to a given key on the calculator keyboard. The card reader made simple linear (no branching) programs possible. The cards were read by a 'bed of nails' arrangement, with individual spring-loaded contacts that would contact a set of fixed contacts on the other side of the card. Two versions of the CP-1 were made, the earlier version consisted of a hinged front cover which would unlatch to allow the loading of a card. A later version replaced this design with a lever-activated mechanism that opened a slot for the card to be inserted in, then closed for reading. 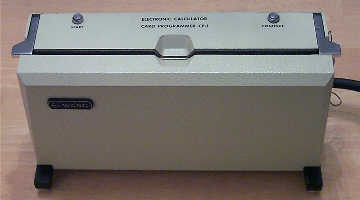 A later version of the card reader, called the CP-2 added the ability for up to four card readers to be daisy-chained together, allowing for larger (up to 320 step) programs, and also added primitive unconditional branching and simple conditional branches based on the sign of the number on the keyboard/display unit the card reader(s) were connected to. Wang Labs maintained a large published library of programs for applications in financial, statistics, and engineering functions. Owners of Wang calculators could send away for listings of programs for a wide range of applications. Users could also submit their own programs to the program library for other users to benefit from. 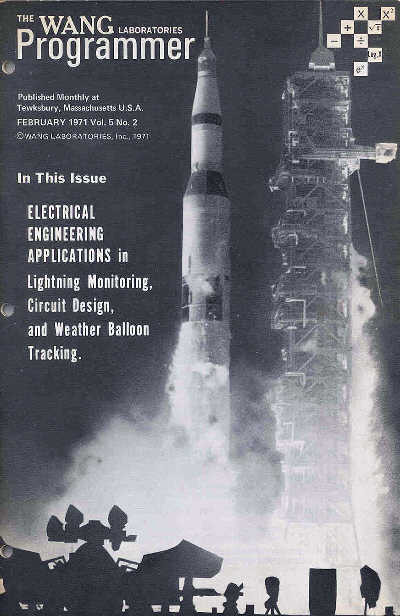 Along with maintaining this library of programs, Wang Labs published a monthly magazine entitled "The Wang Laboratories Programmer" that purchasers of Wang calculators automatically received a subscription to. 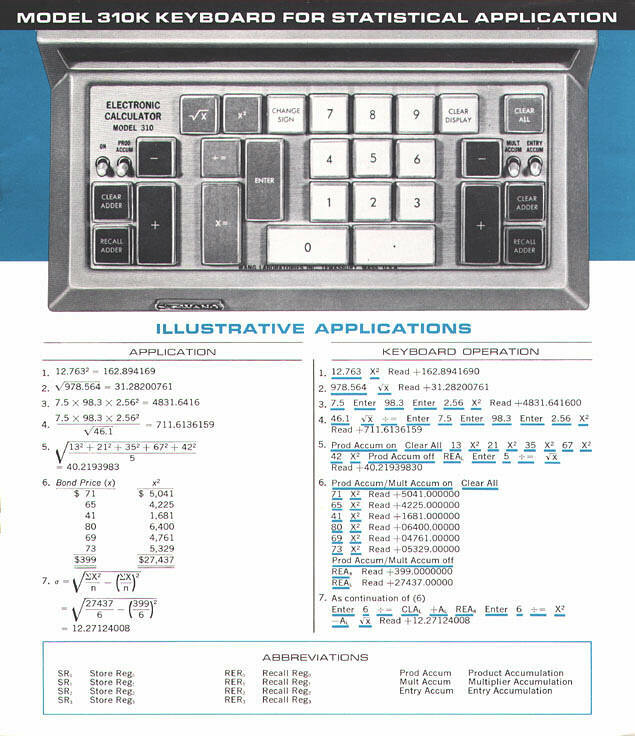 The magazine contained stories about the application of Wang calculators to a wide range of disciplines, along with new product information, program library information, and hints and tips for use of Wang's calculators. Another interesting peripheral device was called the "Item Counter", Model IC-1. This was an awkward looking little box which connected to specially-modified keyboard/display units. This device had an electromechanical counter in it, and a series of switches that select functions on the keyboard unit. Each time any of the selected key's functions (Add Left, Add Right, Subtract Left, Subtract Right, Enter, Multiply, Square Root, or Square) on the keyboard connected to the item counter is pressed, the counter advances one count. This device would be useful for figuring averages or other types of statistical and counting work. 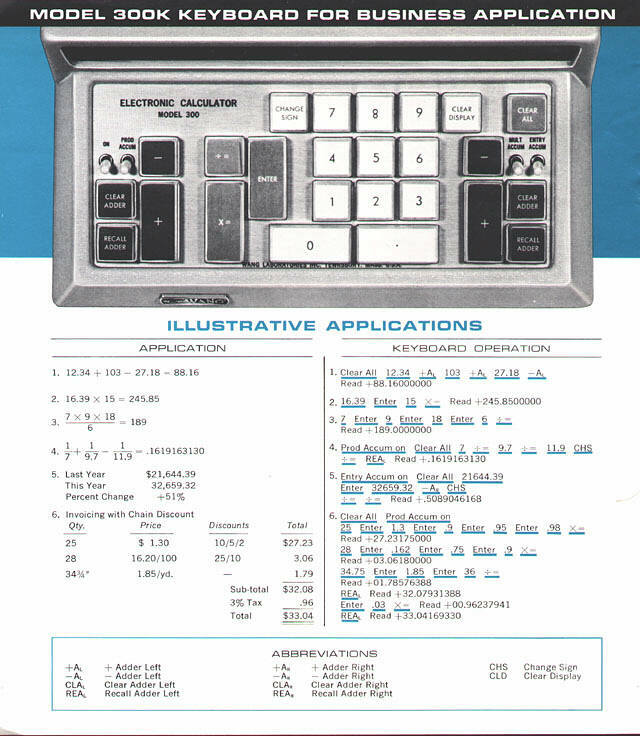 In July of 1967, Wang introduced the Model 370 programming keyboard, which added higher-level programmability to the 300-series calculators. The 370 Programming Keyboard connected to a Model 371 Card Reader (of slightly different design than the CP-1 Card Programmer) allowing programs for the 370 to be read from punched cards. The 370 added additional programming operation codes to allow test and branch operations, capabilities that were not possible with the CP-1 Card Programmer. The 370 Programming Keyboard also included an I/O bus, allowing connection of a wide range of 37x-series peripherals. Later, in March of 1968, Wang introduced the Model 380 Programming Keyboard. This device took the 370 to the next step, by providing true learn mode programming. A built-in magnetic tape drive that accepted a special 'tape loop' cassette provided the storage for programs. When the 380 was in learn mode, keypresses would be recorded onto the tape. To execute a program, the tape would be 'played back'. The 380 was Wang's first departure from their exclusive use of punched card programming. Another particularly interesting peripheral device, introduced along with the 370 programming keyboard, were the Model 372 and Model 373 data storage units. These were rather large units, similar in size to the 300E-series electronics package. The data storage unit provides 16 (Model 372) or 64 (Model 373) memory storage registers (organized logically as rows and columns of numbers), and used core memory as the storage medium. The data storage unit connects to the I/O bus of a Model 370 or Model 380 programming keyboard. The data storage unit was directed towards use in solving array and matrix problems, such as calculating the solutions of simultaneous linear equations.